Choose the funeral you want — no more, no less. The Simpler Times easy-to-use Selector System™ provides an overview of the available services and merchandise, and shows you the total cost of your selection in real time. 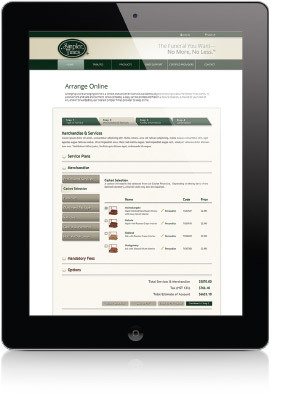 This feature allows you to customize your arrangements; select only those options that work for you and your budget. You can make an informed decision from the comfort of your own home before proceeding. Once you have built your customized package, it can be submitted directly to your provider, printed as a reference, and / or saved in the system to login at a future date to amend. You can also choose to prepay your wishes online, securely and instantly. All funds are held in trust in the strictest of regulatory requirements. If you require any information at any time, don't hesitate to contact your provider who will be able to answer all of your questions and provide any necessary clarification. We offer a simple cremation arrangement that meets your needs and budget. Arrange online your simpler times cremation arrangements.